Friday at school is scone day. Two of our best bakers (and we have quite a few) get up early in the morning and bake a couple of batches each. Just before 9am, they carry them carefully into school in big Tuperware boxes, watched from windows all the while. Once securely in the staffroom, the cakes are then slathered with a generous helping of jam and cream and laid out ready for morning break. The interval bell rings. Classroom doors burst open and today, it’s teachers rather than pupils who are first out the doors and charging through the halls. For a few short minutes it’s every educator for themselves. Manners are forgotten as everyone tries to get to the staffroom in time to claim a scone. I’d like to claim I was more mannerly than the masses but the day I saw the chemistry teacher take not the last scone but the last two scones and then devour them both right in front of my face still brings a tear to my eye. Sift the flour, baking powder and pepper into a bowl. Add the butter and use your fingertips to rub it into the flour until a breadcrumb like texture is achieved. Mix the mustard and milk together well. Add little by little to the bowl and stir with a spoon until a dough is formed. It shouldn’t be too sticky. Roll out until 2cm thick. Use a pastry cutter to cut out rounds of dough and place on a baking tray. Brush with a little egg or milk and sprinkle over some more cheese. Bake in a 200 oC oven (I have a fan oven – increase the heat a bit for non-fan) for 15 minutes. i’d run for one of these! What a giggle the image of teachers charging down the hallways brings. I love cheese scones with homemade soup. Yum! in an old school where i worked we had ‘fat friday’-like the sound of a scone day! 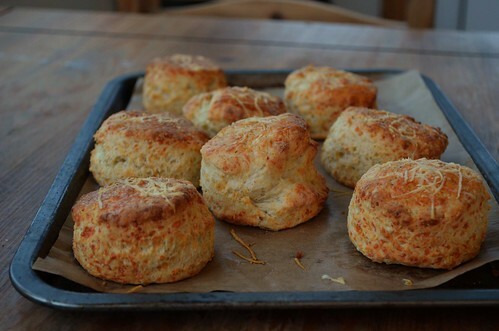 Cheese scones are now bookmarked! Scone Day, what a great idea! Every workplace should have one…..we would all be happier! I have always loved plain,my husband loves cinnamon, but I think we both would love your cheese scone recipe! Thanks. Thanks for sharing this recipe. I made them today – subbing extra black pepper in lieu of English mustard (must put on grocery list!). They were superb! I love savory scones! I have a similar recipe but I use a combination of cheddar and aged parmesan, chopped jalapeno (from a jar), and a bit of cayenne pepper. Never thought to add mustard. I’ll try your version next time! i love scones!! cream tea with whipped cream (and not the nasty clotted cream stuff) – sigh… ❤ i've never eaten a savoury scone though, these look fab. What a nice ‘tradition’ to have at work. I wish I could get our staff team to do something like that. I love cheese scones. Yours look perfect. mmm tasty stuff! Might treat the mrs! 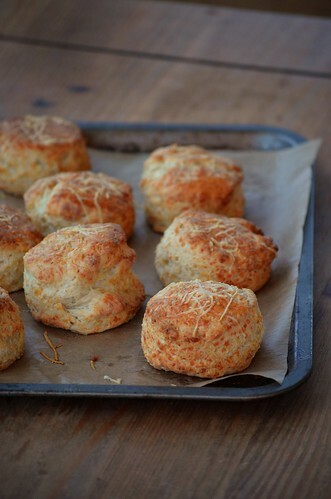 What a great idea to make cheese scones…YUM.